How do I upload a folder to SkyDrive? 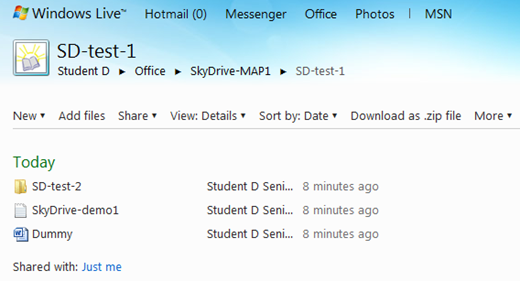 UPDATE 5 June 2012: SkyDrive has been greatly improved. The SkyDrive app for the desktop now allows using SkyDrive just like any other folder on your computer. See How do I install SkyDrive in Windows Explorer? Windows Live provides users with a large online storage area, this area is normally used for photo albums and for document storage. From SkyDrive the “Add files” option does not permit uploading folders. Folders can be uploaded by mapping a SkyDrive folder as a network drive so it can be shown in Windows Explorer. How to map a folder is described in: How can I see my SkyDrive photos in Windows Explorer? The procedure for a document folder is the same as for an album. 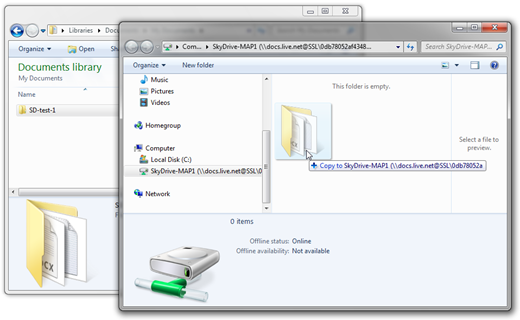 Keep in mind that the entire SkyDrive cannot be mapped, it has to be an individual folder. Once mapped, the folder can be used, almost!, like any other folder on the computer. A folder with contents, including other folders, can be copied to the SkyDrive folder by just dragging as illustrated here (or the Ctrl+C – Ctrl+V keyboard shortcuts can be used). The selected folder will be copied to the SkyDrive folder – since this is an Internet upload, the time will depend on the connection speed. Once the folder is uploaded it is accessible in Windows Explorer. It is, of course, also accessible from SkyDrive. Below is a view of the newly uploaded folder in SkyDrive by the process illustrated above. Is all the contents is there? That depends! Windows Live and SkyDrive are in a state of flux at the time of this writing (November 2010). The procedure described here currently works only for Office documents and plain text documents (DOCX, XLSX, PPTX, TXT). If files of another type were in the uploaded folder those files will not make it to SkyDrive at this time! The Office documents can be inspected or edited online using Web Apps. Just click on the document title and the appropriate Web App is launched.